Combining just the right amounts of swanky and playful (swayful? panky? ), Better Sorts Social Club is a cocktail bar everyone can feel cozy in this winter. 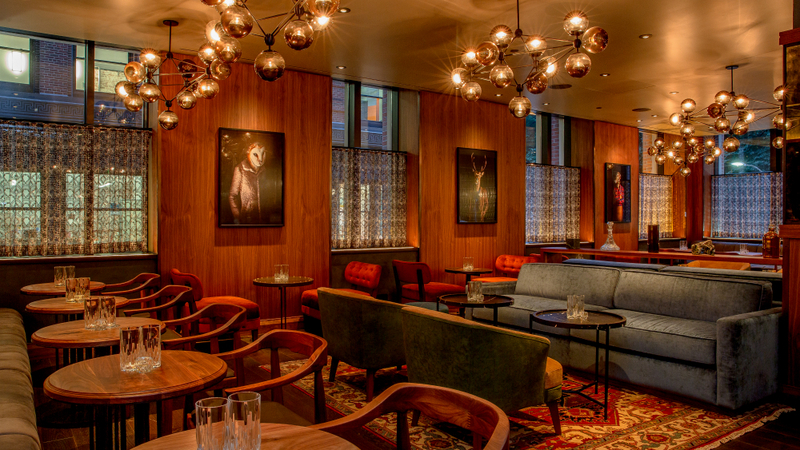 The plush postmodern digs, nestled above the clatter of the Common inside the Kimpton Nine Zero Hotel, provide the perfect perch for sipping on their new weird and wonderful winter cocktail list that proves there’s more to seasonal flavor than boozing up your pumpkin-spice latte. Better Sorts opened with a bang back in October with a drink list that had people buzzing over its head-scratchingly delicious ingredients (ever tried a cocktail made with black pepper pasta water?). But Bar Manager Naomi Levy isn’t one to rest on her laurels, and she’s upping the creative ante and keeping things ultra-seasonal with a brand new list just a few months in. Hop off the T at Park Street and tighten your scarf for a brisk walk across the street to get your hands on the menu. This edition is divided into six categories, where you can take a deep wintry dive down the produce aisle in the Pear, Root Vegetable and Greens sections, or keep things (slightly) more traditional with a beverage that’s Classic, Modern or Contemporary. As a cure for the cold weather, try the new Hot Tramp, made with apple and pear cider, Pierre Ferrand, 1840 Cognac, baking spice, and butter (because it makes everything better). To really turn up the heat, get down with the Hot Gin Flip, a hearty hot drink with a whole egg, Bols Barrel-aged Genever and nutmeg. If your New Years resolution included more veggies in your diet, flip to the Root Vegetable section and try the Be A Legend, a sweet and warmly spicy concoction that combines parsnip with white chocolate horchata, chipotle, and privateer amber rum. Sweet potatoes are a superfood, and you can drink them in the Whisky A Go Go with pecan-washed Jack Daniel’s Rye and Bittermen’s Scarborough Bitters. In case you haven’t made it in yet, many of the hits from the opening menu are still available. The Cacio e Pepe Martini combines black pepper pasta-water syrup with a Gouda-infused vermouth for a savory take on a classic cocktail, and the Fifteen Minutes lets hot pepper jelly and collard greens play together with peanut-washed basil Hayden Bourbon and aquafaba, a chickpea-based egg-white alternative. Honestly, stop trying to imagine what that tastes like and just go order one—you won’t be disappointed. One of the coolest things about the Better Sorts menu is that it makes no value-judgment about nonalcoholic drinks. Two high-concept, no-ABV cocktails are included right next to their boozy brethren: the Tea-totaler’s Old Fashioned uses a malt syrup to affect a whiskey profile along with black tea and bitters, and the Raw Power is a juice cleanse with a culinary kick, combining carrots and ginger with seedlip spice and sanbitter soda. That means your Dry January (or no-fun February) is no excuse to miss out. Take a peek at the full menu online here, and get your hands on these hot drinks while you can; the spring menu will sprout before you know it.